Since our existence as a community of over 160 years, madrasahs have been the backbone source of religious education for our youngsters. The majority of us learn our religious fundamentals from fiqh to tarikh and as we grow older, we identify the madrasah as giving us the basic knowledge for our religious understanding and practice. It seems that where there has been a KSIM centre, there has been a madrasah to ensure religious guidance. This is interesting; it means that for a community without national educational policies or centralised funds, we want to make sure that the values and practices of the Ahlulbayt (a.s) are disseminated to every generation. However, it seems that our model of madrasah has remained stagnant for over 30 years. We do not seem to trace the original vision of a madrasah as place of interactive, critical, free and evolving education, which started with the notion of the majlis (literally, a seated gathering) inside and outside mosques during Prophet Muhammad’s (s.a.w) time. Men, women and youngsters used to ask him questions they desired and fruitful dialogue would occur. This continued in the Imams’ time with huge emphasis on deep learning and enquiry. Overtime in Islamic history, maktabs (elementary schools) were formed to provide a primary type of education. Eventually, madrasahs (schools of higher learning) and hawzas (seminaries) were created but they intended to offer higher, critical education. Today, our concept of madrasah has not taken this evolution into account and instead of trying to provide a critical level of education, we focus on rote-learning of rules, lack diverse subjects such as ethics, theology and sociology and do not contextualize the relevance of Islamic messages to our children’s lives. Even our most celebrated books, Nahj al-Balagha and al-Sahifa al-Sajjadiyyah, are not taught and questions on contemporary issues are obstructed. As a result, we do not forge an active, intellectual and spiritual bond between the child and our sources, the Qur’an and Ahlulbayt (a.s). I propose that the madrasah should be an 'Open Community University' that focuses on two key strands of educational development. The first is that the madrasah should be the base of intellectual and spiritual learning of youths as well as adults. It should be a place where all can attend at all learning levels. It should be interconnected to the mimbar and family unit to the extent that the madrasah does not merely become an isolated Saturday or Sunday school. Rather when an adult or young person listens to a lecture on the mimbar or is engaging with his/her family, he/she is constantly learning through a variety of mediums. The madrasah must provide a cohesive, interconnected educational vision for the whole community. The second strand of the Open Community University is to focus on the holistic nature of a human being. Human beings cannot only learn laws or engage in recitation – they are multi-dimensional creatures with ethics, emotions and desires. Accordingly, social ethics (not just in terms of personal development but in terms of social relationships), applied ethics (e.g medical ethics), theology, philosophy, tafsir, poetry and art need to be taught to students, at least at a foundational level. This will intellectually prepare them for the numerous ideologies which we find in a pluralistic and globalised society. It will also satisfy their thirst for answers and allow them to seek confidence in the institution of the madrasah, rather than outside of it. Here, we must target what we want students to become, how they should develop and what kind of intellectual and moral standards they should reach. Our failure here is perhaps best shown by our lack of attention to post-16 students who finish madrasah and lack of creativity in coming up with original educational techniques for teachers and students alike. We currently rely on teachers training, curriculum development, networking and sharing best practices as the means for our solutions. However, all of these methods only focus on external educational processes rather than the core, internal processes of coming up with a unique educational vision from the teachings of the Ahl al-Bayt (a.s) and developing spiritual techniques of learning. I would argue that redefining the madrasah in this way will create a vibrant intellectual and spiritual institution, capable of adapting to evolving and modern needs. So far, madrasahs face the advent of internet technology and the need to be responsible when using it, the notion of faith in a pluralised world, spiritual humanism, the relationship of human rights to Islam, developing morals in an increasingly corporate and material culture, deriving laws appropriate for the Western culture and bringing the actions of the Ahlulbayt (a.s) closer to our lives. All these challenges require deep responses, not dismissals. At times, they may force us to look at our own interpretation of Islam and we may realise that we need to change our outlook on the world. At other times, we may realise that we need to understand our religious foundations even more. 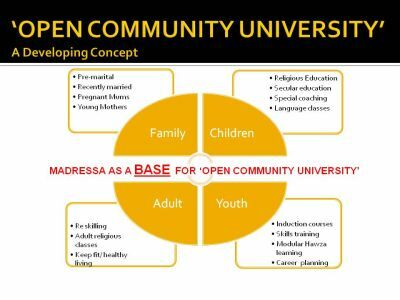 Whatever the response required, the madrasah as an Open Community University would be a good starting point with the aim of producing an enlightened human being capable of participating in wider society, inshallah. In total, there have been 11610 visitors (33276 hits) on this page!